If you are in Seoul from 15 December 2017 onwards, don't miss the opportunity to experience skiing and snowboarding at Korean's favourite slopes at Alpensia Resort in Pyeongchang. Alpensia Resort is about 3 hours plus of driving from Seoul but take it easy. There is a comfortable shuttle bus service that can take you from Myeongdong Seoul to Alpensia Resort. ONLINE BOOKING required. HOW TO TAKE SHUTTLE BUS TO ALPENSIA RESORT PYEONGCHANG FROM MYEONGDONG SEOUL? Shuttle Bus to Alpensia Resort picks up passengers at EXIT 4 of Myeongdong Subway Station (Line 4 of Seoul Metropolitan Subway) in front of McDonald. The location map of this bus stop for Shuttle Bus is shown below. The Bus Stop for Shuttle Bus to Alpensia Resort Pyeongchang is located in front of McDonald's and EXIT 4 of Myeongdong Subway Station. There is only one bus trip daily to Alpensia Resort from Seoul. 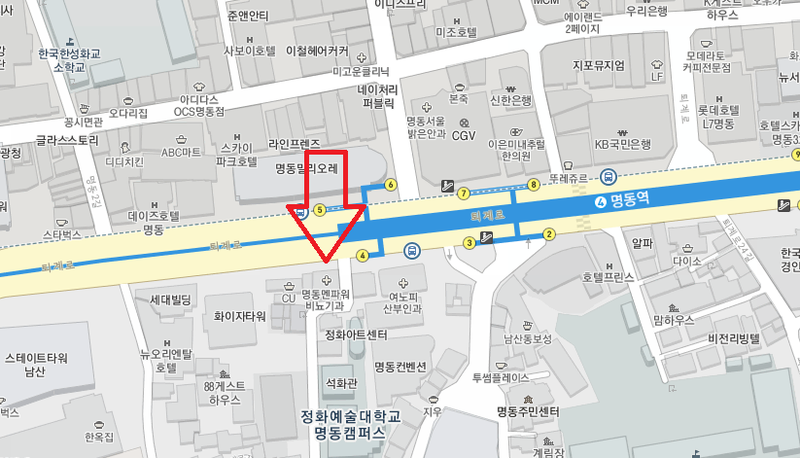 If you are boarding the bus at EXIT 4 Myeongdong Station, the departure time is 7:50AM in front of McDonald's. Make sure you are there 10 minutes before departure time to be safe. 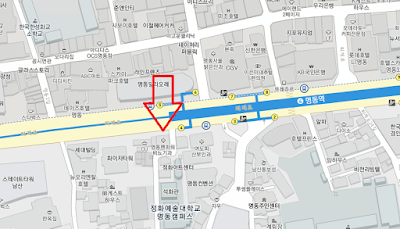 If you board the bus at Lotte Hotel Myeongdong near Euljiro 1-ga station EXIT 8, the pick up time is 7:30AM. After pick up at Myeongdong Station EXIT 4, the bus will be on express non-stop trip to Alpensia Resort in Pyeongchang. The Whole journey is about 3 hours plus but it is worth it once you arrive at the beautiful Alpensia Resort to enjoy skiing and snowboarding. For your information, the bus will stop at the Welcome center of the Alpensia Hotel Resort upon reaching its destination. For returning trip to Myeongdong, you can use the same bus service. The return bus trip departs at 5:30PM from the bus Stop at Welcome center of the Alpensia Hotel Resort. If you miss the 5:30PM bus, you will have to stay overnight at Alpensia Resort. The best choice of accommodation here will be Holiday Inn Resort Alpensia Pyeongchang. The one way bus ticket from Myeongdong Seoul to Alpensia Resort cost US$18.40 for adult and US$16.50 for child below 12 years old (free for baby below 24 months). 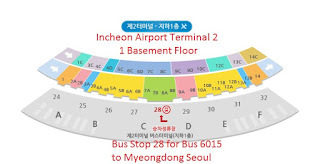 For return tickets (round trip) from Myeongdong Seoul to Alpensia Resort and back to Myeondong, the bus ticket fare is USD27.60 for adult and USD23 for child. Therefore, it is more worth it to buy the round trip with return ticket because you can save USD9.20. It is important to note that upon arrival at Alpensia, you can buy the day pass Ski Lift Pass which include the gondola. On the other hand, ski gears like ski, pole and boots can be rented. If you go in a group, you can get ski coaching lesson. Since there is only one trip a day from Myeongdong Seoul to Alpensia Resort, you must book your bus seat before your trip online. Payment can be done via Credit Card (Paypal) or wire transfer. Upon confirmation, you will be given a booking voucher for printing and a mobile voucher for your booking. You can present the printed or mobile voucher to take the bus on the booking date. 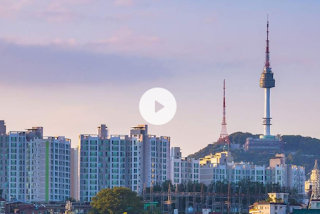 In summary, you just need to book yourself a Ski Bus ticket for a bus trip from EXIT 4 of Myeongdong Station, Seoul to Alpensia Resort in Pyeongchang. Advance booking via website is required. Buy the round trip ticket to Myeongdong to get discount. If the shuttle bus from Myeongdong Seoul to Alpensia Resort is too expensive for your family, you may consider Vivaldi Park Ski World which provide free shuttle bus from Myeongdong. Good evening to you. I would like to know if there is any bus directly from Gimpo Airport to Alpensia and do I need to make reservation in advance. Beside Ski Purple Bus is there any other bus from Alpensia to Skypark Myeongdong Hotel? Yes, you can take Gangneung Bus from Gimpo Airport to Alpensia. The bus starts at Incheon Airport and will stop over at Gimpo Airport to pick up passengers before going to Alpensia resort. Ski Purple bus will bring you from Alpensia to Myeongdong station which is very near to Skypark Myeongdong Hotel. There may be some private tour bus going from Alpensia to Seoul but I am not sure if they stop in Myeongdong. I will be coming to seoul in late march next year. I'm just wondering if it is possible to ski during that time. Is it still open for ski during that time? It depends on the winter season this time but normally it is until early march. The ski resorts will normally announce on the website when the ski and snowboarding season ended. I am traveling from Gimpo Airport to Alpensia, it there a shuttle bus direct from Gimpo Airport to Alpensia? How much does it costs, do I need to make a reservation in advance? I am visiting Alpensia in early December. Do I need to make reservation of ski lift and gear or ski lesson in advance? Can I purchase on the spot? My group will visit Alpensia in Jan 2017 & reserved rooms at Casaville Sinchon Residence for a night before going to Alpensia . Is this hotel near to the Ski Purplr bus pick up point? Please advise. Yes, you can board the the Purple Ski Bus to Alpensia at Sinchon Station near Casaville Sinchon Residence. Enjoy skiing and snowboarding in Alpensia Pyeongchang! I cannot find the bus line that stop at myeongdong on the Ski Purple bus website. Which line should I book? There isn't any myeongdong <-> alpensia bus line there. please assist. It is SA Line 5, Myeongdong Station. Make sure you click on "Alpensia" on the left menu. Otherwise you will only see the schedule for Yong Pyong Resort. Yes, you can take purple ski bus from Seoul Station to Alplensia resort. SA LINE5 shuttle bus will stop at Seoul Station at 7:55am daily. Advance booking is required. You can make booking for your bus trip to Alpensia here h t t p : / / www . purpleskibus . com . My group of 4 plans to stay in Alpensia or Yongpyong for skiing in 01 day. The day after, we love to visit Seoraksan but so far we could not find any bus to there. Would you kindly advise how to reach Seoraksan from Alpensia/Yongpyong. Many thanks. If we booked the Purple ski bus to Alpensia Resort , are we entitle to the above coupons e.g. 30% off for rental of skiing equipments? Everyone is entitled to enjoy this discount coupons for Alpensia Resort. Hi, i checked the website but it's not providing me a "round trip " option, only purchasing one-way tickets separately. Can you advise please? Also, our hotel is the Intercontinental...is that walking distance to the drop off in Alpensia? Thank you. For return trip or round trip from Alpensia Resort, please inquire from Tour Korea direct through email help @ tourtokorea . com or telephone number +82 70 7847 5850. Hi , how do I get from Ena Suite Hotel Namdaemun to Myeongdong Station Exit 4 ? What is the estimated traveling time ?